Have you ever heard of Javanese Lulur? If you have already visited a spa in Indonesia, or live here, probably yes. But do you know what it is and how the ritual is done? Keep reading to find out. Used to cleanse, soften and purify the skin, the Javanese Lulur is a royal ritual originally began in the palaces of Yogyakarta (on the island of Java, Indonesia) around the 17th century. Prospective brides used to complete the ritual every day, for 40 days, to prepare the skin for the big wedding night. But what was once an exclusive privilege of royalty, is now offered in various spas through out Indonesia. The entire process begins with a scrapping of the feet followed by a full-body massage. Next comes the lulur itself, which is a natural body scrub, made from saffron mixed with rice flour, traditional spices and other roots, to remove dead skin cells. Then the yogurt is applied on the whole body to refresh and soften the complexion. To finish it off, an aromatic dip in the bathtub and, as you prepare to leave, the jamu* is given to you. The rituals can be experienced individually or as a couple, who want to enjoy the moment together, and the length of treatment varies depending on the spa chose; in some cases it can take up to 3 hours. The result is baby-soft skin with an enchanting look and feel. * Jamu is a super elixir drink that has been part of the Javanese routine for over a thousand years. It is used to maintain good health, eliminate diseases, increase beauty, strength and endurance. There are several versions, but the most popular form of the drink is made with saffron, ginger, tamarind and honey. The Bimasema is the spa of The Dharmawangsa Hotel, which is a true urban oasis and is located in a lovely part of Jakarta. There the ritual can be done individually or as couples and lasts 90 minutes, with prices starting at IDR 1,100,000. The spa of the five-star Four Seasons Hotel offers a 90-minute lulur from IDR 1,800,000. Chi, located in the Shangri-La Hotel, offers individual treatment, starting from two hours, at prices starting at IDR 990,000. Martha Tilaar is one of the most famous brands of Indonesian cosmetics, focused on using the local ingredients and valuing the country's beauty tradition. The brand has the largest network of spas in Indonesia and has several locations in Jakarta and neighboring areas such as BSD and Bintaro. There the ritual lasts 2 hours and costs around IDR 450,000. 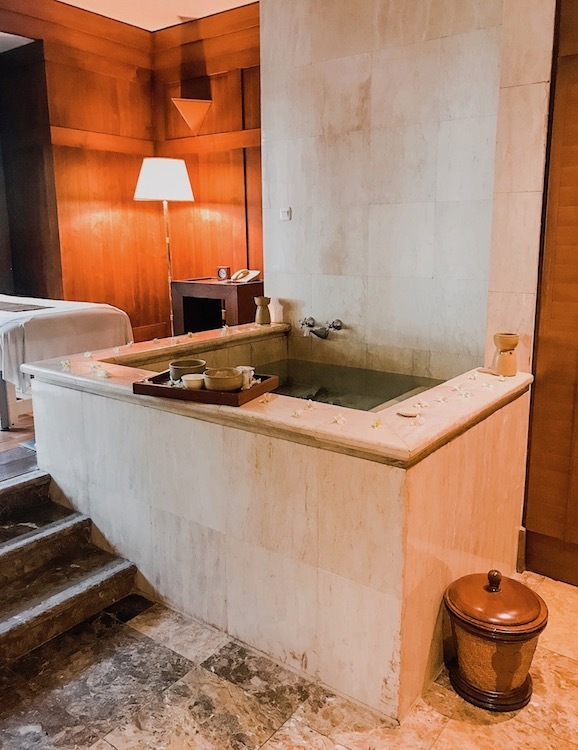 Providing a more economical option than the others, at Jamu Body Treatments, located in Cipete in the south of Jakarta, the ritual can be experienced for IDR 430,000 - without fees - and lasts for 2 hours. There the ritual is only available for individuals. Also located in the south of Jakarta, Puri Santi is the most economical option, offering only the lulur - just the exfoliation part of the ritual – at prices starting from IDR 250,000 for 1 hour of treatment. The bath with petals can be included for an additional fee. When visiting Indonesia, take a few minutes (or hours) of your stay to experience the Javanese Lulur, and savour the experience of this royal treatment a few moments.